This half-day Hong Kong sit-in-coach tour takes around 5 hours. It is available either in the morning with pick-up time of 07:50 - 08:40 or in the afternoon with pick-up time of 12:50 - 13:40. 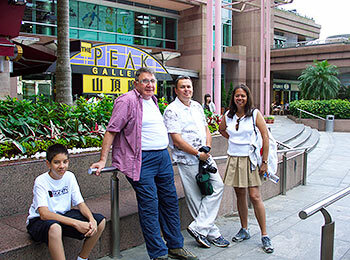 Our guide will pick you up at the hotel lobby at the appointed time, and then transfer you to the Victoria Peak. There is a bowl-shaped Peak Tower at the peak. From its top floor - the Sky Terrace 428, you can have a full view of the Victoria Harbor and the whole city. 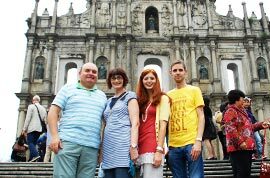 Then, we will head for the Aberdeen district by a 30 minutes' bus ride to experience local fishermen's daily lives and then take another 20 minutes' ride to Stanley Market which is full of booths and stalls selling Chinese characteristic handicrafts, silk fabrics and clothes as well as distinctive restaurants and cafés. This half-day Hong Kong tour package will round off with the TSL Jewelry Factory where you can appreciate a lot of elaborate ornaments. Our guide and driver will deliver you back to your hotel after the trip is over. Occupying the highest position of Hong Kong, the Victoria Peak can provide you the best view of the Victoria Harbor and even the whole city. Once alighting at the upper station of the Peak Tram, you can see the bowl-shaped Peak Tower in front of you. Climb up to the Sky Terrace 428 on the top floor and you will enjoy a 360-degree panoramic view of the city. It used to be a bustling fishing village. 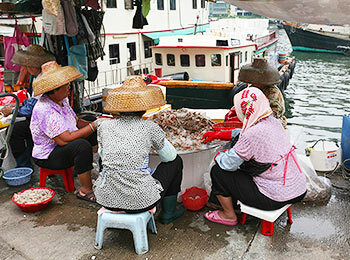 Although numerous high-rise buildings have sprung up here in the past decades, there are still people preserving the traditional lifestyle that live their life on the boat, especially at Bei Fung Tong Typhoon Shelter. You can see a lot of boats berthed at the harbor or going fishing on the sea. 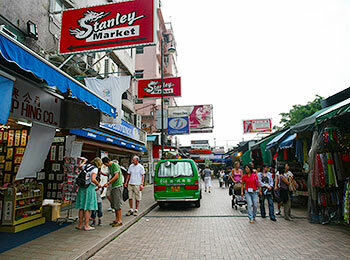 Stanley is one of the settlements for foreigners in Hong Kong, and the Stanley Market is the liveliest place there. 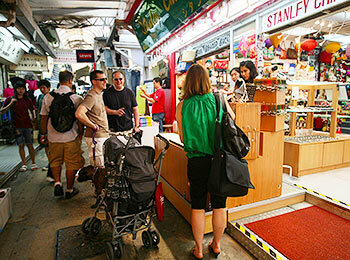 You can find the market full of shops selling various goods such as clothes, silk, ornament, and handicrafts. It is also a cultural district. If lucky enough, we may encounter some folk artists performing brilliant shows on the street. Pick-up Service: Generally, our free hotel pick-up and drop-off service is provided for group members staying at the downtown hotels. If your hotel is outside the range, your tour operator will inform you of the additional transfer fee. Our local representative will send you a fax to your hotel in Hong Kong to inform you the meeting time, attraction's information and emergency contact one day ahead of the schedule. Please kindly check it. Infant Price: There is no cost for an infant 0-2 years old. Confirmation: Upon receiving your booking request, confirmation will be sent within 24 hours. We guarantee departures even with one person. Payment: Full payment is required at least two days prior to the trip. We accept payment by PayPal, Alipay, Wechat and Bank Transfer. Cancellation: Your payment is fully refundable if you cancel more than 7 days prior to the trip. For cancellation between 3 days and 7 days before the trip, 10% cancellation fee; no refund if you cancel within 2 days. Once the day trip begins, any unused portion is non-refundable. Transportation from HKIA to Regal Oriental Kawloon Hotel. Taking airport shuttle bus is the best way from the airport to the hotel. There are two lines available heading to the Regal Oriental Hotel from the airport. The one is E23 with a cheaper cost of HKD18 per person but there are 23 stops to reach the hotel. The bus runs from 5.30am to 12am in the midnight. The other is A22 which only stops 11 stations but costs HKD39. It’s from 6:00 am to 12:10 am in the middle night. Hello, I have 7 in HK. Is it enough time to go to The Peak?Is there somewhere I can see the city with less time?I read a site that where there is a tour that does not need to queue to go to The Peak (Klook) is reliable? 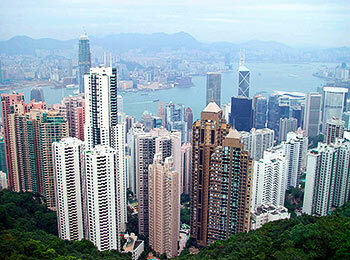 According to my experience, 7 hours are not enough to tour Victoria Peak from Hong Kong International Airport. 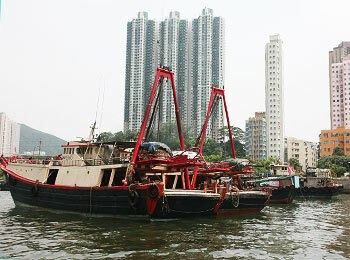 You can visit Victoria Harbor and Causeway Bay which are in downtown area. From the airport to Victoria Harbor, you can take the Airport Express to Hong Kong Station first, then walk to Central Station and get on Island Line to Causeway Bay Station. Upon arrival, you can walk to Victoria Harbour. It takes around 1 hour on the way. Besides, you are more recommended to have a short tour to Lantau Island by cable car if you would like to have a panoramic view of the Harbor. From the airport, you can take E23 or E34 to Tung chung cable car station where you will get on the cable car. The cable car journey takes around 25 minutes. According to the policy, you are allowed to stay in Hong Kong within 14 days without visa if you hold an Indian passport. However, I'm afraid that you cannot join in this half-day seat-in-coach tour because of your limited layover time. 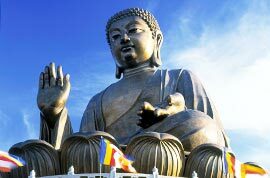 Thus, you are suggested to hang out at City Gate Outlet or take Ngong Ping 360 to see the Tian Tan Buddha which are near Hong Kong International Airport, and then head back to the airport 3 hours earlier to catch your onward flight. Thank you. Hi! 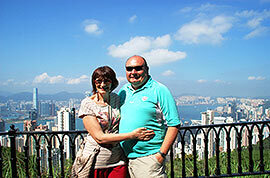 How do we go to Ngong Ping 360 from Pearl Guest House 54 nathan rd., tsim sha tsui, hongkong? You can take bus 1R from Kowloon Park straight to Ngong Ping. Btw, it takes about 100mins and around 45HKD.